In the late 1980s, Alf Roberts, a miner in the Klondike gold fields, discovered something quite unexpected. At first, it appeared to be just a pair of jeans. Upon closer inspection, he could tell they weren’t typical of modern Levis. He carefully extracted them from the frozen muck and put them aside so he could keep working. 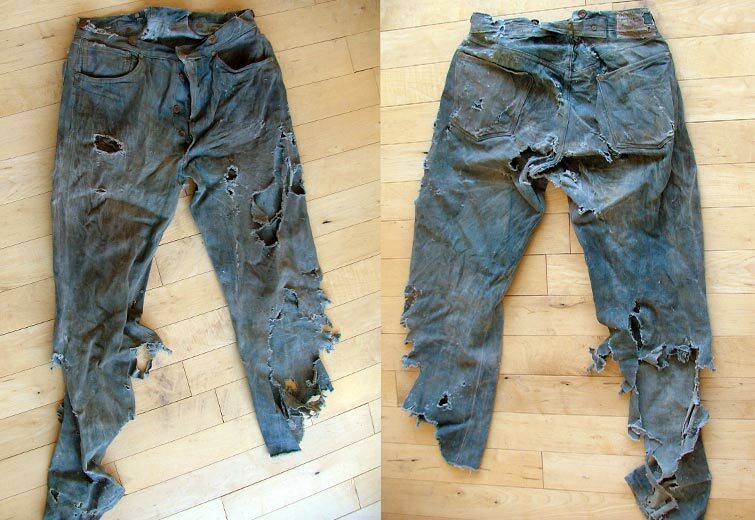 Alf had found a remarkably well-preserved pair of original Levis 201s. Finding oddities while placer-mining for gold near Dawson City is actually not that uncommon. Miners over the years since the Rush of 1898 have dug up all kinds of interesting things such as ancient bones from mammoths, steppe bison, extinct horses and very rarely ice age lions and camels. Mammoth ivory from recovered tusks is used by craftsmen all over the world to make beautiful and distinctive jewellery, knife handles and other artwork. 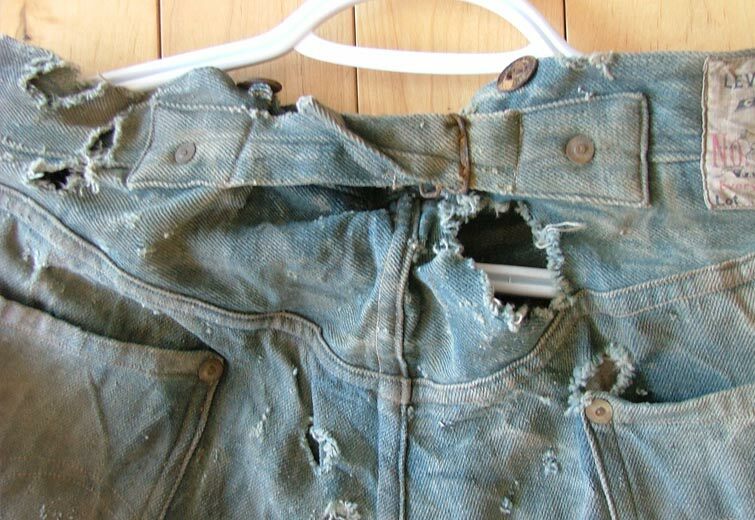 But, to find a pair of old Levis left behind by another miner is rare indeed. 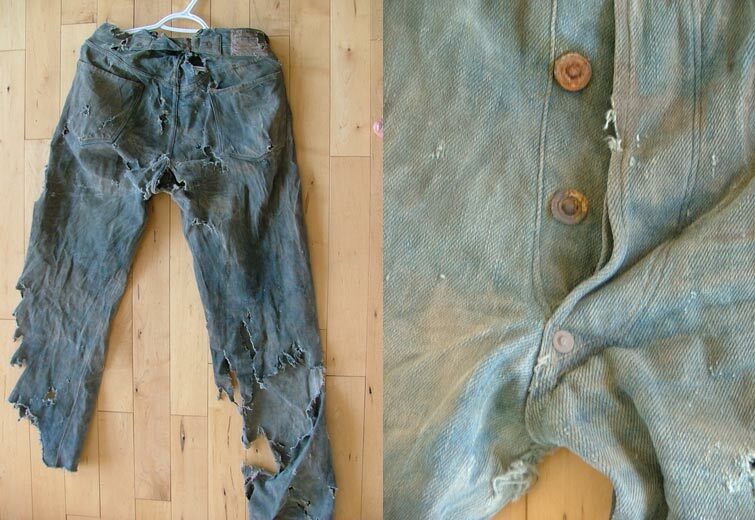 The jeans were found laying frozen on the bedrock about 20 feet underground in a hand dug mineshaft. They have not been washed since found, if ever. The same as nowadays, work clothes for dirty work did not get cleaned very often. Alf and Marlene Roberts have been mining in the Dawson area since 1978. They run a small Mom and Pop operation which keeps their overhead down and gives them a chance to work the ground thoroughly. Marlene drives the track loader and excavator and does the clean up when the gold nuggets are collected. She herself makes beautiful jewellery from some of the gold they find. Alf is a keen collector with a sharp eye, and while it slows down the gold collecting process, he watches for signs of interesting things while working. Over the years. he has carefully extracted several ice age bones as well as two huge mammoth tusks. According to Mr Robert’s research, when he staked a claim on Homestake Gulch in 1978, no one had worked the area since the early 1900s. He found a woman’s Melton jacket underground that had been patched with a piece of burlap. In the pocket he found a receipt for a purchase of milk in Dawson City dated Nov 12 1898, and the patching seems to have cost $0.25. He also found a Dwight’s Baking Soda cookbook and expense diary, currently at Archives in Whitehorse YT under Roberts. But how old are they? The exact date of original manufacture is unknown. 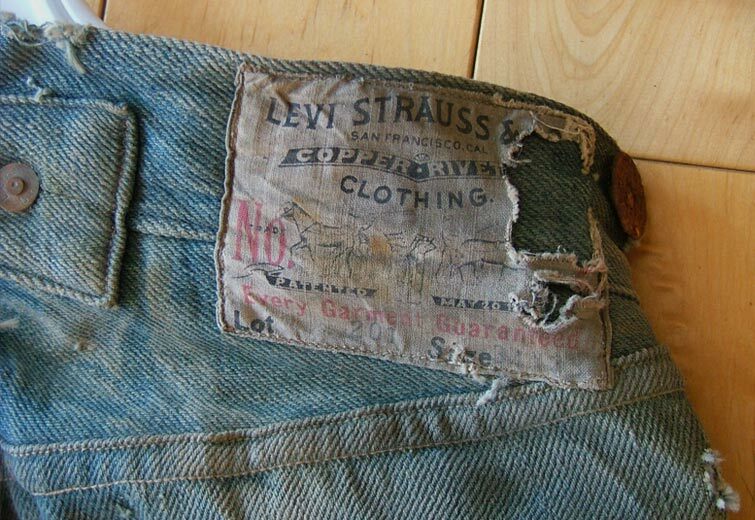 Hazarding a guess is made even more difficult because of a fire in 1906 that destroyed the entire Levi’s headquarters wiping out all of the documentation from just about the first 50 years of the company’s history. 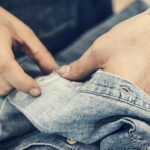 What we do know from contemporary papers and financial correspondence however, is that the first examples of the 201 jeans appeared between 1880 and 1890, and that production continued until well in to the 1920s. 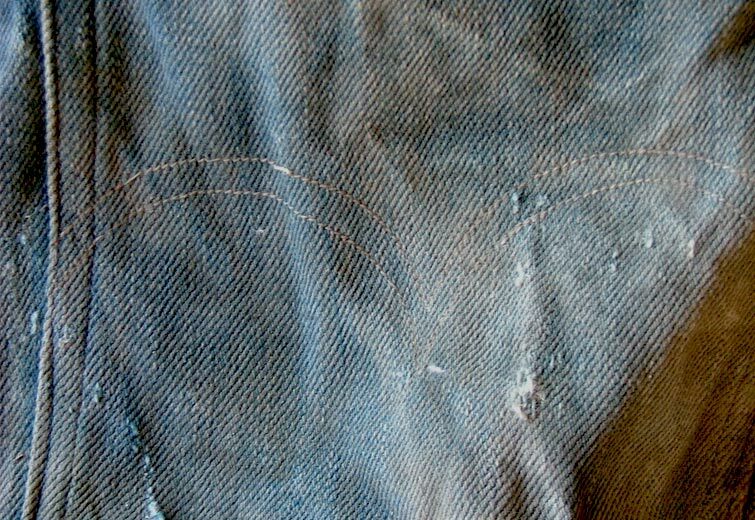 But, since Homestead Gulch laid fallow during the latter part of that period, there is every reason to believe that these Levis 201s date right back to just before the dawn of the 20th century. 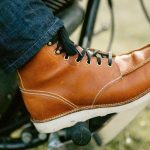 These original Levis 201s are an antique item and, as with all antiques, they are worth as much as someone is prepared to pay for them and not a penny more or less. We have seen similar lots in recent times being offered at around $3,000. Also, when we consider that 1940s examples can reach up to $2,000 or more, that ball-park doesn’t seem unreasonable. All we know for certain is that one bold collector is going to emerge victorious with a unique slice of indigo history so, if you’re interested, just shoot a mail to [email protected] and make an offer.